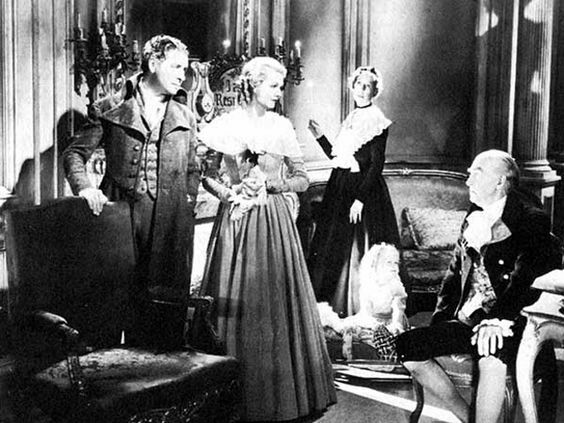 This adaptation of the classic novel by Charles Dickens finds courageous British lawyer Sydney Carton (Ronald Colman) defending French aristocrat Charles Darnay (Donald Woods) from false accusations of treason against England. Carton also becomes enamored with Darnay’s beautiful bride-to-be, Lucie (Elizabeth Allan), but she and Darnay marry and begin to raise a family in England. Then, when Darnay falls into the hands of French revolutionaries, Carton once again comes to his rescue. When I was studying A Tale of Two Cities in school a few years ago, my grandfather asked me to watch the 1935 movie adaption (which is the one I’m reviewing today) with him. 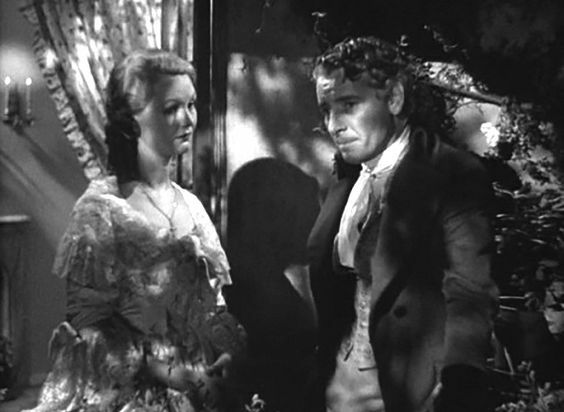 Fresh from watching the Greer Garson version of Pride & Prejudice (to this day, I bemoan the lack of literary and historical accuracy in that movie) and thinking that black-and-white movies were boring (I didn’t know anything back then, eh? ), I reluctantly agreed. Two boring hours spent watching a bad adaption of what was, at the time, my favorite classic? No, thank you. But then I ended up hiding buckets of tears from everyone else in the room and went away singing the film’s praises. Maybe old movies weren’t so bad after all! 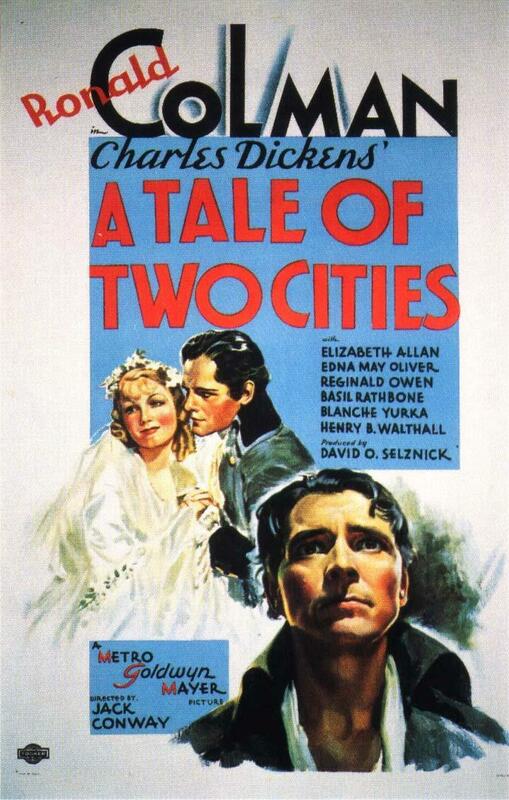 (Imagine that…) While Casablanca was the first b&w film to make me truly love Old Hollywood and its awesomeness, A Tale of Two Cities (1935) almost did the same. No ‘old movie’ had made me cry before, so that was a new experience (and I do love books and movies that make me cry) and the whole thing was extremely well-done. Anyway…fast-forward to the present day, in which about seventy-five percent of all movies I watch come from the 30’s-60’s, and where I’ve just re-read ATOTC, and now I’m eager to re-watch the movie and see if it measured up to how I remembered it. And did it? Ohhhh my goodness. It turned out to be just as good as I’d remembered (if not better), made me cry lots, and also fall in love with Sydney Carton all over again. In terms of book-to-film accuracy, I’d say this movie is one of the best adaptions (especially for such an old one) – nearly every line of dialogue is taken straight from the pages of the book, scenes that are changed or combined or added flow well and make sense, and nearly all the casting is spot-on (more so than a lot of adaptions these days). Let’s talk about book-to-movie changes first (though I’m sure I won’t be able to touch on all of them). Firstly, the resemblance between Sydney and Charles isn’t really a major part of the plot. “What? !” you may exclaim. “Isn’t that one of the biggest parts of the book?” Well, yes. It is. But in the context of the movie, everything makes sense – Sydney wheedles everything out of Barsad (everything concerning the false accusations about Charles being a spy, I mean) the night before the trial, so when he stands up in court, it’s more Barsad recognizing the man he spilled the beans to (and being afraid that Sydney would betray him) than admitting that Sydney and Charles look extremely alike. And then in the final scenes – the exchange, the bit in the holding cell, etc. – Sydney hides his face quite a bit and keeps to the shadows (don’t worry, it’s not contrived or anything), so that all makes sense. And I actually appreciate the change because, yes, it works perfectly in the book, but movie versions either have Charles and Sydney played by the same actor (ugh) or have them look nothing alike and pretend that they do (double ugh). So I think this version gets it pretty much right. This review ended up being much longer than I’d thought it’d be, but I’m glad I got all my thoughts across. (Well, most of them.) Have you ever seen this movie? What did you think of it? And what did you think of Ronald Colman’s Sydney? I’m glad they did such a great job! It’s so annoying when a really good book gets a mediocre film adaptation; so it’s awesome that this one actually lives up to expectations. RONALD COLEMAN AS SYDNEY FOREVER.